Two Little Cheers: Glucose free, low carb pizza. Where's the crust? I'm always looking for low carb dinner ideas. I especially love recipes that can remake my favorites, such as pizza. I found this recipe, "where's the crust pizza" from the www.plainchicken.com blog. It calls for a "crust" to be with a base of cream cheese, egg and parmesan cheese. Then you top it with your normal pizza toppings. We tried it out tonight. I have to say that honestly it wasn't bad but, I did miss the actual crust. I'm a bread junkie those. I could live on carbs and other than cooking lower carb at dinner for Mike, I pretty much do. This will satisfy a pizza craving though. I'm not sure I'll make it again but if you are looking for a glucose free, low carb pizza this is definetly one to try. Use a hand mixer to mix all this together. Spread into a greased 9x13 pan and bake for 15 minutes at 350 degrees. After it is baked let it cool for 10 minutes and then top with whatever pizza fixins you like. 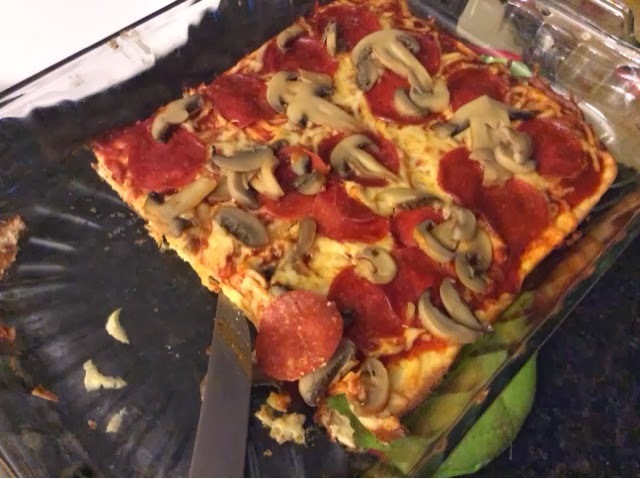 I put sauce, cheese, pepperoni and mushrooms. Then bake it again for another 15 minutes or so. This picture is after we already started eating it. Ha.